Increase web presence, brand awareness and most importantly, qualified inbound leads. We are a full service agency that uses a combination of marketing strategies to help you achieve your sales goals. We work with companies of all sizes. Our qualified team will help your clients find you online. SEO services are our forte. Our expertise in this field increases your search engine ranking, boosts your web presence, and gets you qualified leads and results. Want to increase online engagement and boost brand awareness? Our social media marketers can help. Find new customers across platforms with a professional (and fun!) social media strategy. Web designs need to attract and convert visitors. Our in-house graphic designers & web designers create unique websites that convert. We know the marketing power of a well-designed website. Have an idea for a web application? Our web development team builds custom web apps that are intuitive, smooth, and fit your specifications. Get the functionality without sacrificing your unique idea. 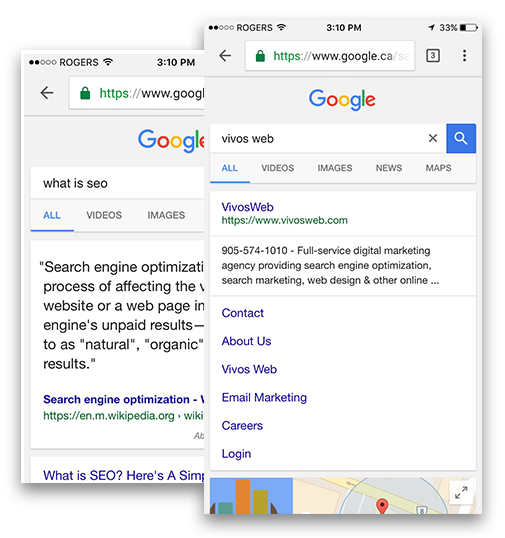 VivosWeb is a full service digital marketing agency in Hamilton providing broad solutions to cover all your internet marketing needs. We will help increase your company’s online visibility. VivosWeb brings customized solutions to Search Engine Optimization (SEO), Search Engine Marketing (SEM), Social Media Marketing & Management (SMM), Mobile & Email Marketing, Web Design, Web Development & Restructuring, Web Hosting, Cloud Hosting, and much more. We provide Search Engine Optimization services to businesses who are looking to attract a specific audience to their website and convert them into clients. Our SEO services help potential clients find your site more easily. You don’t have to look for new clients – let your clients find you! Design a website you can be proud of! VivosWeb provides high quality website designs, plus professional service and open communication from the start through to the end of a project. Your web design will include regular reporting and a dedicated account manager to handle any input or concerns every step of the way. Our in-house web designers know the latest web trends, advanced techniques, and creativity that will draw your clients in and convert. We are a proud Google Partner Agency and Adwords Certified. We manage big-budget Google AdWords campaigns for a variety of clients and industries. Our team stays up-to-date on the latest methods, best practices, and trends to stay one step ahead of your competition and get you results. Get new clients quickly and get a boost to your business. Keyword research is one of the most valuable aspects of search engine marketing – both SEO and PPC. We start with an analysis of your website’s content and common keyword searches and behaviour of clients in your industry. Any website ranked above you in a search engine is your competition. Our goal is to get you the leads and traffic by increasing your rank in search engine results. Search engine optimization requires significant industry research before starting a campaign. Our Hamilton SEO team has the experience and skills to quickly find the right industry terms that will drive traffic to your website. Are all your web pages optimized? On page optimization is a centrally important factor in SEO, but it’s one that so people tend to disregard. Our Hamilton digital marketing agency begins with a site audit that detects all the errors on your site. Common site errors typically include inconsistencies in image titles, page titles, descriptions, and the content itself. We then fix these errors and optimize these areas to help increase your search engine ranking on an ongoing basis. Off Page Optimization is the second major aspect of SEO. This off page work includes building relevant links to your website, generating qualified visitors and leads, and increasing your authority on search engines. This helps us promote your products and services off-site while increasing your visibility and brand awareness to the public. They don’t even have to visit your website to learn about your company. Our expert link-builders always pursue high quality links from reputable sources and never engage in any link-building activity that could negatively impact your site. Local optimization of your website is extremely important for generating local sales. We work to optimize your local web presence using Google Maps, citations and other products that will attract people from your community to your website or storefront. We work with businesses looking for local digital marketing in Hamilton and in other cities, as well as firms working to promote local search for their franchises across the country. The importance of local SEO is growing – don’t let your competition get a head start! A landing page is a specifically-designed web page that doubles as a sales pitch. Give targeted users the specific information they are looking for to get faster and easier conversion. A call to action is what gets visitors to convert into customers. VivosWeb will implement a clear call to action in the best locations of your website so it’s both highly visible and compelling. Your content needs to be optimized to successfully attract web searches for your products and services. We can target keywords and write copy that will engage and convert visitors.